Abu Dhabi, UAE. 22nd September 2010: Abu Dhabi Tourism Authority (ADTA) and HSBC, the world’s local bank, have entered into a five-year partnership which sees the bank become title sponsor of Abu Dhabi’s flagship PGA European Tour event – the first international title sponsorship of an Abu Dhabi sporting event. The partnership means the tournament, which next runs January 20-23 at Abu Dhabi Golf Club, will now be known as the Abu Dhabi HSBC Golf Championship and its 2011 prize fund rises to US $2.7 million - a US $500,000 increase - making it the richest purse of the Tour’s Desert Swing. ADTA, which initiated the championship in 2006, is also committed to hosting the most impressive playing field yet and is optimistic of attracting at least five of the world’s Top Ten players and to mounting its most expansive spectator offering of improved facilities and attractions in its championship village. “This partnership ushers in a new era for the championship and golf in Abu Dhabi,” said His Highness Sheikh Sultan bin Tahnoon Al Nahyan, Chairman, ADTA. “It is in many ways a coming of age for the championship and for Abu Dhabi’s ambitions as a credible golfing destination. The first player to confirm for the upcoming Abu Dhabi HSBC Golf Championship is reigning champion and two-time winner Martin Kaymer, also the current US PGA Championship title holder and world number five. Kaymer of Germany, who clinched his debut European Tour win in the UAE capital more than two years ago, first lifted Abu Dhabi’s coveted Falcon trophy in 2008 and repeated his success in 2010. ADTA is optimistic Kaymer will defend his title against a stellar field of champions. Already confirmed are world number three, Lee Westwood, and two-time Abu Dhabi Champion, Paul Casey. Others from the world’s elite are currently being firmed up and ADTA will announce major additions to what it expects to be the event’s most competitive field to date. ADTA’s championship ambitions have been matched by 26-year-old Kaymer who says he’s eager to return to Abu Dhabi Golf Club’s stunning Par 72 National Course and mount a bid to become the first golfer to clinch a hat-trick of Falcon trophy wins. “Abu Dhabi is very special to me as it is where I won my first title. I enjoy everything about it, from the beautiful weather to the amazing hospitality and facilities. Having seen the field, I certainly have my work cut out for me in defending the title,” said Kaymer, who makes his Ryder Cup debut next month. “It is great news that HSBC is joining ADTA as the bank is a great investor in world golf and its events are always first-class in every aspect. They will fit perfectly with this prestigious tournament. Westwood, winner of over 30 international tournaments, has earmarked Abu Dhabi’s Falcon trophy as the next addition to his already burgeoning silverware collection. “Everything about the event is quality and the players are treated like royalty throughout the week. With the great weather and quality facilities it is the ideal place to start the season. I think HSBC is a great addition as it will bring experience of running the World Golf Championship-HSBC Champions to an already world-class championship. I think the field will be stronger than ever as a result of this new partnership,” said Westwood. Paul Casey, the current world number seven, believes the partnership will be a major boost for golf in the emirate. “In the ADTA and HSBC we have two wonderful supporters of world golf who are both very forward thinking in their implementation making their tournaments stand out above the rest. I think they will be an amazing combination,” said Casey. The new Abu Dhabi partnership builds on HSBC’s burgeoning portfolio of world-class golfing tournament sponsorships. 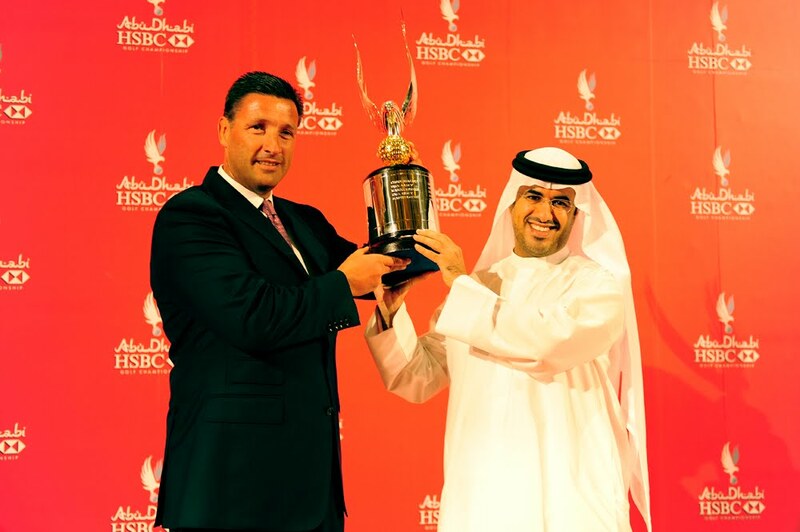 The Abu Dhabi HSBC Golf Championship is the bank’s first golfing title partnership in the Middle East. The move also further underlines HSBC’s commitment to ‘Championing Golf Worldwide’ as it looks to build on its junior, amateur and professional programmes in more than 25 countries including the WGC-HSBC Champions in Shanghai and the HSBC Women’s Champions in Singapore. “ADTA has been very generous in welcoming us as the Abu Dhabi HSBC Golf Championship’s title sponsor. Golf is a very important part of HSBC’s marketing programme and the Middle East is a key region to the bank’s business. We have seen significant growth of our business and brand through our global golf sponsorship programme in recent years and we feel ADTA has established a top-tier event of the highest quality that fits extremely well with our brand,” said Simon Cooper, Deputy Chairman and CEO, Middle East and North Africa, HSBC. Looking to attract the championship’s biggest ever spectator turnout, ADTA has promised a substantially expanded championship village with more attractions, restaurants, cafes and competitions. “Our determination to build both the championship’s playing field and the spectator offering is a clear signal of our intention to consolidate Abu Dhabi’s mounting credentials as a golfing and leisure destination of distinction,” said His Excellency Mubarak Al Muhairi, ADTA’s Director General and Chairman of the Championship Committee. “This emirate’s golfing facilities have expanded significantly over the past year with Abu Dhabi now boasting three world-class, championship-ready facilities. The championship takes Abu Dhabi’s name to a world of golfers who are able to book golfing vacations through the increasing number of international and local tour operators who are packaging the sport here. Championship visitors will this year find a significantly enhanced leisure offering with more golf courses, mega attractions including Ferrari World Abu Dhabi and stunning new resorts. The latest championship developments have received an enthusiastic response from the European Tour. The Abu Dhabi HSBC Golf Championship is backed by a high-profile sponsorship line-up that also includes Etihad Airways, Al Naboodah, Emirates Palace hotel, Etisalat, Airbus, Xerox, CNN and Rolex.